The Pewag PLBW lifting point can rotated a full 360º and pivots a full 180º. 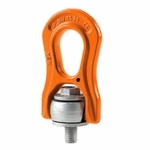 This means it can be positioned at the desired angle due to its replaceable and patented spring. The PLBW has been designed for 5-fold safety within the permissible field of operations. Each lifting point is marked with an individual serial number. The PLBW is available with metric or UNC-thread. A full reference table with Working Load Limits is a part of the user manual packaged with each lifting point. The hexagon-special screw is made from Grade 10.9 material, is secured against loss and is also replaceable. The screw is 100% crack-tested, covered with a chromate VI-free finish to protect against corrosion and marked with WLL and thread size. The screw can be tightened with a hexagon wrench or a spanner wrench.